i love this light! excellent build quality and a very clean beam pattern! I recommend enloop pro batteries for longest run time. I am a big fan of 90 degree angle head lights and wanted to try out the Nichia 219C led, and this light gives you that option at a great price. Small size almost disappears in your pocket. Nice clip, removable. Able to clip on the brim of a hat or shirt for hands free use. Lockout feature built in or by loosening tail cap. Beam pattern, nice sized hot spot with good transition. Good for up close work as well as at a distance. No artifacts visible and no noticeable rings. I have been having to care for somebody with some very serious wounds and have to change the dressings and monitor the wounds for signs of infection. I have been comparing my different lights as to how the wounds and skin appears under different led lights. I have 11 different lights, some very high end flashlights. The skin tone and damaged tissue looks the most natural using this particular light and LED (Nichia 219C) configuration. Most by a very large margin. I did not purchase this light for this particular reason, it just so happened that I had it ordered and received it at this point in time. User interface: Takes a little while to get used to the hold down to turn off. I am used to clicking once to turn lights off. Not bad, just different. 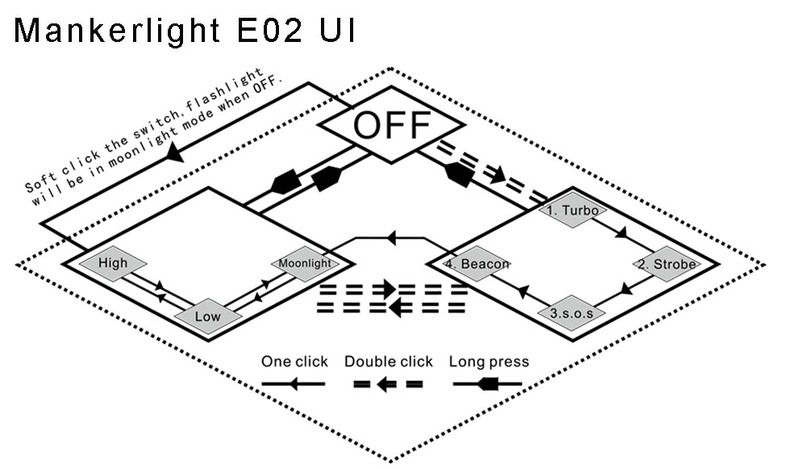 Not a big fan of the blinking and strobe options, but they are there and you don't have to use them. I would purchase a headband if that was available. I would like to see this light available in aa as well as the 123 / 16340 battery configuration as well. The light was purchased by myself and no money or merchandise was given for the review. Click the button below to add the Manker E02 Best AAA Flashlight 220 Lumen Right Angle Light to your wish list.